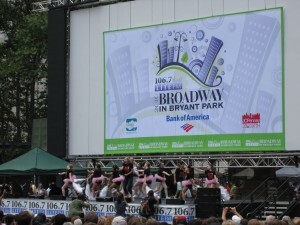 The second installment of the free summer Broadway-at-lunchtime extravaganza (aka Broadway in Bryant Park) enjoyed much less steamy weather than its premiere week. I also indulged in one of the park’s signature green chair this time, which resulted in a much further spot for filming, which I didn’t realize was a consequence until later. Let me know if the videos are too difficult to see, or if you enjoyed the full-stage perspective. This week’s concert, which boasted a hefty lineup, kicked off with the oddball of the group—The Radio City Christmas Spectacular, featuring the Rockettes. I can’t be the only one who isn’t keen on Christmas in July. Thankfully, the Rockettes showed the audience mercy and refrained from performing to any Yuletide tunes. Instead, they relegated their performance to a brief routine of high kicks and chorus lines to an instrumental number (no Christmas carol I could make out), and exited the stage roughly three minutes after they began. Someone’s not getting coal in their stocking, come December. The first real show to take the stage was the king of Broadway, The Phantom of the Opera. Phantom actor John Cudia was not in attendance, but Paul Schaefer knocked it out of the park with “Music of the Night.” Interestingly, Phantom only got two songs, which, as I would find out, left more time for newer shows. Usually, all shows get four numbers. This week, the allotted numbers were quite unbalanced. The cast of South Pacific was up to bat next, and they were easily the best performers of the day. I’ve thought for a while that the South Pacific chorus is the strongest I’ve ever seen on Broadway. Danny Burstein and his men proved it once again with “There Is Nothing Like A Dame,” making full use of the stage, something that Memphis could have done (but more on that later). Laura Osnes (ah, a star!) was up for the Bryant Park challenge and sang “A Wonderful Guy.” Seeing her perform was a first for me, and I was quite impressed with her vocals.